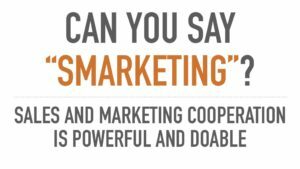 Smarketing is when sales and marketing departments work together harmoniously. Companies that implement a smarketing approach achieve 400% higher revenue growth than companies that do not. Critical for B2B, the Smarketing concept was popularized by HubSpot. This presentation was created by Jay Baer and originally delivered for the Cisco 2016 Partner Summit. B2B marketers and B2B sales people should find this information of interest.